A taste of the orient invigorates this all-American lamb salad. In medium bowl, combine green onions, 2 Tbs sesame oil, rice wine or apple juice, soy sauce, brown sugar, oyster sauce, and salt. Remove 2 Tbs and mix into lamb. Cover, refrigerate, and marinate for 30 minutes. Remove from heat, rinse, drain, and toss with remaining 1 Tbs sesame oil; set aside. In large non-stick skillet, heat 1 Tbs oil over medium heat. Add one-half of the shallots and stir for 10 seconds. Add lamb and cook, stirring occasionally until no longer pink, about 4 to 6 minutes. Transfer to a large bowl; keep warm. Wipe out skillet and add remaining 2 Tbs oil. Add remaining shallots and stir 10 seconds. 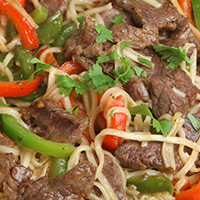 Mix in noodles and reserved sauce, cooking for 3 to 4 minutes or until sauce is absorbed. Add spinach, snow peas, and carrots. Stir-fry 3 to 4 minutes or until spinach is just wilted. Pour into bowl of lamb. Add peanuts, toss, and serve.